The Lemon Tart is Book 3 in D.A. Batrowny’s children’s series, The Artt of Early Learning. This series is designed for parents who may want to work with their children as their first teachers. Artt is going with his mother for his first day at nursery school. She’s brought a lemon tart for the nursery school teacher, Miss Parson. Once Artt’s in the nursery, he sees the other children there. They’re each playing with their favorite things, and Onyx, Miss Parson’s dog, is also in the room with them. When it’s time for a nap, the tired children settle in to sleep, but Onyx is not at all sleepy. He sees the children’s favorite things lying there and decides to add them to his pile of toys. When the kids wake up, they start to cry when they realize their things are gone, and events get even more complicated after that. The author provides an appendix which contains a listing of the things that many children at the age of 13 months can and cannot do, and a list of things that parents can do to promote their child’s development. D.A. 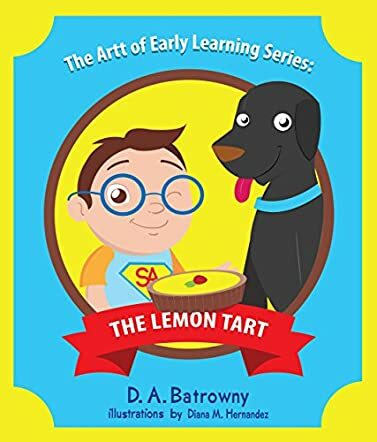 Batrowny’s children’s book, The Lemon Tart, The Artt of Early Learning, Book 3, is an entertaining and informative guide designed to help parents get involved in their children's early childhood development. The author’s story highlights the different stages of development reached by each of the children at the nursery school, and how they react to the situation that occurs after their favorite things disappear. The story is appealing and funny, and Diana M. Hernandez’s illustrations perfectly fit the mood of the panels. Artt is a marvelous character who is clearly on the upper end of development for his age. His discovery of the lemon tart and clever plan to pacify the other children is inspired. Batrowny’s book gives parents guidelines to chart their children’s development and shows them how to take an active part in that process. Sharing this book with a child should also prove to be an enjoyable reading experience for both parent and child. It’s most highly recommended. I love the whole concept of this series, and couldn't wait to take a peek at the latest book. Smart Artt is growing fast, and has now reached 13 months old. He's off for his first day at nursery, and his Mum sends a delicious looking lemon tart along for Mrs.Parsons. Smart Artt is far more interested in having his favourite teddy bear with him, though. As with books 1 and 2, this is a book that parents can read with their children, while they also learn about the developmental milestones that are suitable for each age range portrayed. In this book, developmental milestones for a 13 month child are discussed, followed by a list of suggested activities that can help promote your child's development while at that age. Another bright, fun and educational addition to the Smart Artt series! Nice, colorful illustrations and a sweet story to help little ones look forward to nursery school! I love that Artt is always thinking and looking for ways to make things better.Developmental milestones listed at the end of the story are a nice touch. A few months ago I read the last book in this series and didn't realise that the little boy would grow up during the succession of books. Smart Art is now going to nursery school and at the back of the book there is a list of what children at 13 months can do. Another list, also included, of things to do to promote growth and development with this age group, will be very useful for parents. The story is sweet and when the naughty dog, Onyx causes trouble, Smart Art comes to the rescue. I like that Onyx also helps to save the day and redeem himself. From what I've read, D.A. Batrowny is highly qualified to write these books and I'm glad that there are more to come. By this third book we're seeing what the author and illustrator have been building with the series. The main character (Artt) is growing up book by book. This fits in with the authors interest in human development and her notes about developmental milestones at the back of each book. Having a few of these will encourage discussion and thinking about how children grow and develop and how to encourage that development. cute little book that I think kids will love because of the fun had by the youngsters in the book.The author did a great job in keeping the book simple enough for young readers but with a fun story to keep young minds entertained and learning.